If you didn’t already have a ton of important decision to make (like who you are spending the rest of your life with), music can sometimes feel like an afterthought. But music is one of the most important choices a couple makes when planning a wedding. Choosing the right entertainment for your wedding can be the difference between a blast and disaster. 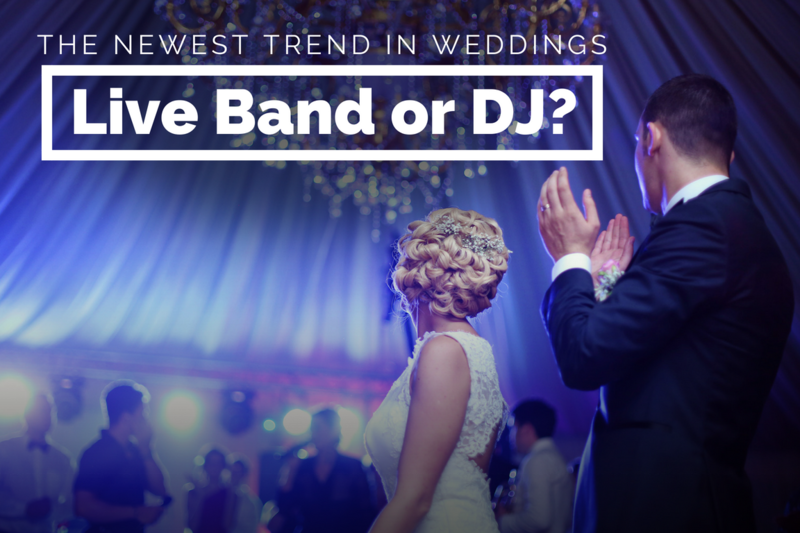 And thus, clients and planners alike face the with the age-old question – live band, or DJ? Of course, the battle of DJ vs. live band is full of pros and cons on both sides. A big wedding deserves showmanship, which a big band has in spades. But what if your crowd is full of kids who grew up on EDM? Then a DJ is the way to go. How can you possibly choose and make everyone happy? At Bizar Entertainment, we have a different question: why not both? The traditional wedding band is a mark of class and taste for many clients. Live bands add finesse and power. Additionally, there is the draw of the band leader. Band leaders act as built-in emcees; they charm the crowd, control the music, and maintain the vibe. Of course, a band leader can’t do it all. Wedding bands are often only willing to learn one to two new songs at most. Jeff Bizar himself has first-hand experience on the other side of the table – DJing. Back in 1980s and 1990s, Jeff and his Chicagoland colleagues worked as DJs that doubled as emcees. These DJs ran into the same problems as the with overwork that bandleaders experienced. In 1992, three companies from New York came to the area and “looked at us like we were crazy.” This is because the New York companies had been working for years in a separate DJ / emcee system. Of course, this system was incredibly efficient…and, as with any efficiency, was quickly copied by everyone in the area. And so, we come to today’s question: how can we ensure that everyone gets what they want? The landscape of wedding entertainment is changing. It’s all about personalization, and one-of-a-kind experiences. If you can create a custom cocktail just for your reception, why not create a custom music experience? Just like the DJ/emcee system was founded, There is a need to have different skill sets at the event. We estimate that within the next five years, most couples will want a “fused” experience – a live band, emcee, and DJ all at once. This shift may occur for many reasons – for one, it’s a better deal. A fused “band” is smaller in personnel, but still carries a big impact. There is something to be said for the intense energy a live band can provide. Nothing compares to the sound of a live drummer when you want to amp up a crowd. The main reason a client may want a fused experience? Because it can guarantee that everyone gets what they want. At any given time, your team will be able to fulfill any given request. Interested in creating your own fused music experience? You’re in luck! Bizar Entertainment has a working relationship with one of the best live bands in Chicagoland – the Larry King Orchestra, or LKO. Bizar Entertainment and LKO fuse to create a one-of-a-kind experience called LiveWire. Our clients at these LiveWire events would be the first to say the vibe is incredible. We combine the power of six incredible instrumentalists with the guaranteed power of our super emcee and DJ staff. Combine this with the best sound system in Chicago, and you have the ultimate live band/DJ fusion experience. If you’re interested in having LiveWire appear at your next event, get in touch! With our strengths combined, we have the power to get everyone in your venue moving. Contact us today to discuss packages for your upcoming wedding. © Copyright 2019. Bizar Entertainment.